A weekly blog reviewing a variety of critical thinking concepts including: logical fallacies, bad arguments, spurious reasoning, incorrect logic, myths and more using humorous stories, pictures and rather poor drawings to illustrate the ideas. This week we take a look at one of the tastier fallacies - Having Your Cake. Have you ever encountered someone who seemed like they were playing both sides but couldn’t figure out what was up? Then you’re in the right place. Oh and somehow we get a little camping in too. Come on in and take a look at the inflation of conflict fallacy which is when we hear experts bicker and decide to throw out all the good information. Plus, it’s somehow related to lawn mowing. Read on to see why. Have you ever wondered what misleading vividness is or how it affect you? Well then you’re in the right place. We’ll take a look at that and see how impacts the life of every video gamer out there. Today we look at the nirvana fallacy, what it is, where to see it and what to do about it. How can we use it to save squirrels and why do we like Tarzan? Read on to find out. Some numbers sound big and important, but are they? Numbers that have a lot of decimals might be too accurate for their own good. Read on to see why and maybe visit the fan museum too. When someone makes a statement that appears to change their entire history of thought, does it really or are they just trying to fool us? Can one new bit of scientific research change all past scientific knowledge (hint, I doubt it). If you like wading in rivers, you’ll like this. Do we have bias? Does it affect our decisions? Can we be trusted if we have bias? This episode looks the where bias can exist and when it’s OK and not OK. How does this apply to eating cookies. Read more to find out! Today we look at causal reductionism which is when only one cause is given while many might exist. We’ll see why it happens and how it can affect us. Somehow a cat is involved in all this. You’ll just have to read to see why. Syllogisms. More than just a fun word to say. These are a logical concept that routinely shows up in general discourse. We check out several types of syllogisms, where they can occur and how not to make mistakes. All with the help of a bird. Read more to find out! What is the No True Scotsman fallacy and how doe it affect it? Where might we see it. Why am I fixing fence posts and playing video games? Lets do some light math and look at why it’s so easy to mess up percentages especially when the baseline is moving all over the place. What is a baseline and what does it have to do with hamburgers? Read on for the answers to these questions and more. Let’s face facts, shall we? There’s a whole lotta stuff I don’t know. Why is ice slippery? Why do we drive on a parkway but park on a driveway? How long should I wait after eating to go swimming? But nothing vexes me more than why in a peanut butter and jelly sandwich the piece of bread with the jelly on it goes on top. A variety of polls show that the jelly should go on top. However, an exhaustive search (like the 1st page of Google) turned up only some vague ideas. Something about heavier ingredients or taste sensations on the bottom but nothing was definitive. Science is oddly silent on this item and yet they are the same people who figured out how bumble bees fly. So why are there no in-depth studies on this or even an undergrad study project? When presented with this type of problem, there is only one possible solution - Aliens. It’s the only answer that makes any sense at all. Aliens, who we all know built the pyramids, also left us the PB&J and they designed it so that the jelly goes on top. The reason no scientists will study this is that to look into it would be to confirm once and for all that aliens exist. And they just aren’t allowed to do that. Big Jelly has total control and the aliens running it want to stay hidden. See, this is the only explanation that works. Hopefully you thought about that and went “Um what?”. Yeah, I stepped in all sorts of logic problem buckets. Let’s take a look at them. I’ll start with basing a conclusion, aliens, on the fact that I don’t understand why jelly is mostly top bread based. This is a personal incredulity fallacy (or argument from ignorance). It basically means that a conclusion is based on the fact that there is a lack of evidence or not understanding the existing evidence. As weird of a fallacy as this seems, it shows up far too often. The universe isn’t expanding because I’m not getting bigger (not understanding that universal expansion happens in space over large scales, not locally). Then the leap I made – aliens must exist because there is no evidence for why jelly goes on top. This ignores lots of perfectly rational explanations such as: the data is bad and jelly isn’t more often on the top than the bottom, maybe it is based on ingredient flavor and position when eating, perhaps it’s just cultural phenomenon, etc. Wow, what else did I do? Well, I also jumped to a conclusion and in the process stumbled into a black and white fallacy. In essence, I said either jelly physics has a reasonable explanation that I would understand or aliens did it. I left no room for anything in the middle or even the chance that new information might show up in the future. Since you can’t prove it wasn’t aliens, I also made this a non-falsifiable argument. I’m right because it’s impossible for you to prove me wrong when in fact it should be up to me to prove aliens are real and controlling vital PB&J technology. That’s 3 logical errors in row – I’m really on a roll! For good measure I threw in some conspiratorial thinking. When there is a non-falsifiable claim it’s nice to also have a conspiracy on your side in case anyone just happens falsify it. Then, you can just say “they were in on it” or “someone must have gotten to them”. Assuming a conspiracy exists can happen when we don’t see that our logic was faulty and we just weren’t thinking clearly enough. If we recognize that our logic was faulty, then we can make ourselves more open to seeing other possibilities and likely find there is no need for a conspiracy. Its entirely possible I made other logical errors, but these are the primary ones and by examining them my claim is turned into nonsense. Here’s the important point of critical thinking I want to make sure is regularly mentioned – I don’t have to feel bad or ashamed because I held an incorrect view or opinion. Instead, I’m happy to recognize these issues and work towards a better understanding of the subject. Too often we’re told making a mistake is bad and we should never admit to it. That stops us from growing – learning through mistakes is a vital part of our education. Of course that makes me a jerk (again, for the record, I don’t actually do that, illustrating and all). It also makes me a pedant or engaging in pedantry. This is when a person is overly concerned with minor details and rules, and it shows up in language quite a bit. That grocery store sign that says “12 items or less” should really be “12 items or fewer”. We all understand what is meant and get on with our shopping though, we don’t need to know the difference. I will argue that knowing there is a difference is, however, useful. In a grocery store context less and fewer are easily interchanged. If you are reading a scientific article the author might be using these terms with their exact meanings implied. These terms can show up in dieting – less than 12 grams of sugar per day and fewer than 3 servings of ice cream. By understanding the differences we can more easily see meaning and nuance. If we run across them used incorrectly we don’t have to get bent out of shape. Another fun but useful bit of pedantry is the meaning of terms venom and poison. Venom is a Spiderman villain and Poison is an 80s rock group. No, wait, that’s not it. Venom and poison are actually the same thing but differ by their method of application. If the substance is injected, then it is venom and that’s how we get venomous critters – they bite or sting to inject the venom. Poisons, on the other hand, are something that we ingest (or inhale). So, by these rules, if I extract the venom from a snake, drink it and it harms me, I poisoned myself (I don’t recommend doing this). What if I extract the venom, put it into a syringe and inject it into myself, I guess then it’s still venom. The important point is that there is some kind of toxin in my body that probably isn’t good and I should see a doctor. Drat, I said toxin up there, didn’t I? This is a tough one, especially these days. It’s a word that normally has a pretty broad meaning but has now become a thing unto itself. We all need to quit taking in toxins and we need to get the toxins out. Here’s the confusing bit, toxins aren’t a thing. Everything is toxic to us, it just depends on the amount. Oxygen, yep, too much will kill you. Water, yep, that one too. Vitamin C – you’re gonna need a lot but it does get toxic at some point. Other items are simpler to determine: hydrochloric acid is bad even though we all have some anyway in our stomachs, alcohol is good at the start but too much is bad, radioactive substance are generally not good, tide pods we know aren’t good at all. When we hear mention of toxins in our bodies we should immediately ask what substance is it that we have too much of because toxin is more of a catch all term. Understanding the differences in words is not of itself a bad thing. It’s ok if someone calls a snake out on the hiking trail as poisonous, we don’t really need to correct that. If we’re talking with a physician, herpetologist or poison control center then we may want to try and use these terms with their more exact meanings. Knowing when to look for and use the more detailed meanings of words is the useful bit of knowledge to keep in mind. The real kicker here will come when someone tells me I didn’t define pedantry accurately enough. With a finite set of topics which I could discuss its inevitable that I’d eventually have to talk about probability, isn’t it? As I write more articles that don’t feature probability you have to think that the next one will feature it. The longer I go not writing about probability, the more I’m due, obviously. Are you sure about that? Is there anything else going on here that could lead us to the wrong conclusion? Probably. We’re going to have to go back to the roots of probability. Of course, I’m talking about toast. Let’s assume that we have a piece of fair toast with a burned image of Stephen Hawking on one side. A piece of fair toast is one that if tossed in the air has an equal chance to land on either side. I toss that piece of toast and it lands Stephen Hawking down. I toss it again and it’s Hawking down again. One more toss and the late great professor is still staring at the floor. Surely on the next toss it’ll land with the renowned physicist looking to the heavens. We’re due to see him! Probabilities are sometimes viewed as hard to understand, but that’s not true. The basics are pretty simple. When we temporarily levitate our bread over and over, each toss is independent of the one before it. That means the results of the first toss do not affect the second, the second does not affect the third, and so on. This is also known as classic probability. Hawking’s toast, when tossed, has a 50/50 chance of landing physicist up. If we try it 5 times and dear Stephen always stares at the floor we may feel like there is a greater chance he’ll be face up on the next try. But that’s not the case as it’s still just 50/50. Our trusty human brains are always trying to make sense out of nonsense which is very helpful in keeping us alive. Sometimes it can lead us astray though. These classic, or independent, probabilities make us want to think of them as dependent. We know the toast can’t always land astrophysicist floorward and any time we see too many examples like that we start to think the next can’t be the same, that we’re more likely to get a Hawking. This is what we have to be on guard for. Our brains want us to think the independent actions are actually dependent. Lots of things that we think are dependent probabilities aren’t. A sports team with a losing streak is due for a win simply because they’ve lost a bunch. But really, the number of games lost doesn’t affect the next games outcome. It’s more likely that player health, caliber of the opponent, venue or other factors would affect the outcome. Weather is another example – it’s been so dry lately we’re due for some rain. However, the number of dry days does not affect the next days weather. I know that weather is extremely complex and we could argue that there is some effect but it’s so tenuous and difficult that the simpler answer is that one day’s weather does not affect the next. Ask anyone in a long-term drought. A poker player who’s had some bad hands may feel they are due for a good one but if the deck is shuffled between plays they are no more likely to get a better hand than on the last one. There are conditional, or dependent, probabilities as well. And we have to go back to toast for this, or more generally, breakfast. Have you ever gone out for breakfast and only had the server bring syrup if you ordered pancakes? If so, then what is the probability you’d get syrup without ordering pancakes? Maybe it was in error, or it’s just standard practice if you want more maple-y bacon. The probability of getting syrup is based on the type of breakfast ordered. Syrup is dependent on pancakes. This doesn’t mean you won’t get syrup if you don’t order pancakes, but that you are less likely to get your distilled tree blood without first ordering height challenged cake. Was I really due to talk about probability? No, there is a very large set of topics I could discuss. With the passing of each article, the likelihood of my delving into probability would not change overly much. If you hear a probability brought up just ask yourself – is it independent or dependent. Independent – then the odds never change. Only dependent occurrences can affect the odds. With each toast flip we may wish we could see more Hawking, but alas we’re no more likely than the last time. Episode 5: Can you confirm that negation? I’m still a bit new to this whole writing (and maybe educating a bit too, no?) thing. That leads me to look for information on how to write better, get into the flow more quickly, keep my thoughts aligned, engage the reader, etc. And there are a whole host of helpful articles and speeches out there such as : 5 best socks an aspiring writer should wear, dental habits of successful authors, hat choices to make the most of your next blogging experience, and so on. What does reading articles like these make me do? If you said “think”, then you’d be right. 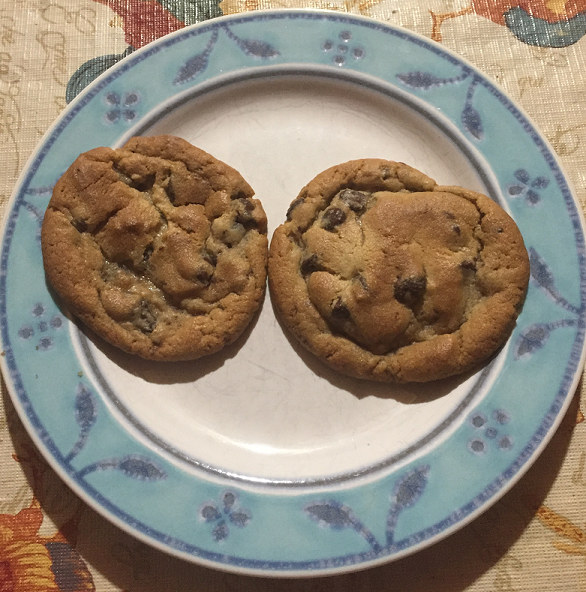 If you said “eat chocolate chip cookies”, well, you’re also right. I might find out that 80% of bloggers that were successful always wrote while wearing a beret. What none of those pieces ever tell me is what did 80% of the unsuccessful writer’s wear? It’s entirely possible that they also wore berets. These types of articles never tell us the opposite. Learning to ask such questions is known as “testing the negative” and it’s a really important concept. Plus, it’s one of the best ways to help avoid the dreaded “confirmation bias”. We inherently like things that agree with what we think. A recent study might show that employees who nap at work are more productive. What? I like naps, why can’t I do this? But what is the flip side of the study? How did those employees who didn’t nap fair? Perhaps they had just average productivity but accomplished the same amount because they weren’t sleeping. We are inundated with positive only articles. Why? Probably because we’re supposed to buy something. Or maybe it just wants us to click on it (see episode 1). The trick is to learn to ask yourself what is the inverse in the statement. Did you know that 75% of Fortune 500 CEOs have two cups of coffee every morning (numbers for illustration only)? Well, what do non-fortune 500 CEOs drink? Could they have two cups of coffee too? Or, how many people who drink two cups of coffee are Fortune 500 CEOs? There are often several different ways to look at a number or results of a study, but we’re usually just given the one that confirms the statement. This type of thinking is useful in a wide variety of situations to keep us from blindly doing or agreeing with things. As someone who is aspiring to do a bit of writing, I’ll hear that a good way to get better is simply to get up early and write for at least 1 hour every day. OK, sure, sounds plausible. I’ll bet there are people who did this and got better. But how many people did this and it made no difference, or perhaps even made them worse (maybe stress and schedule actually reduced their creativity)? You can also learn to counter anecdotal wisdom with this kind of thinking. Putting on my pants left leg first has made me the ink connoisseur that I am. OK, but how many ink connoisseurs put their pants on right leg first? How many don’t wear pants at all? Testing the negative isn’t just a way to throw out bad information. It can also serve to reinforce something. 70% of people who engaged in at least 20 mins of strenuous exercise each day had better overall lung capacity? Well, we could ask what percentage engaged in the activity and saw no increase or even a decrease and if we found that 25% saw no increase and 5% saw a decrease then we know the 70% probably isn’t too bad. Exercise is generally good for you. We could ask how many people engaged in no strenuous activity each day and saw an increase in lung capacity. If that is small, maybe 5%, then we know that the inverse is helping to show the validity of the main claim. Again, these numbers are for illustration only. So, go ahead, be a little more negative. Testing the inverse is a skill and like most it takes practice (how many got better without practice, you should ask). A bit of the negative might just make you more positive.